Smart Object improvements - Maintain the links to external files by automatically packaging them in a single directory. You can also convert your existing embedded Smart Objects to linked Smart Objects. Improved Layer Comps - Save time now that you can change the visibility, position, or appearance of one layer in a Layer Comp and then sync that change to all the others. Plus, easily see the attributes of each Layer Comp, and toggle a Layer Comp within a Smart Object. Blur Gallery motion effects - Use Path Blur to add blur along any path and Spin Blur to create circular or elliptical blurs. The Mercury Graphics Engine makes all Blur Gallery interactions fast and fluid. Focus Mask - Let Photoshop help you start a mask by automatically selecting the in-focus areas of your image. Focus Mask works great with potraits and other images that have shallow depth of field, and the Mercury Graphics Engine delivers fast performance. Improvements to Content - Aware technology - New technology in Content-Aware Fill, Move, and Patch smoothly blends areas containing gradients, like skies, so you can create seamless, realistic results like never before. Smarter Smart Guides - Forget trying to align multiple shapes or objects at exact distances from one another on canvas. Now you can quickly see the distance in pixels between objects so you can lay out content with precision. Desktop fonts from Typekit - Choose the fonts you need from the Typekit library, sync them to your desktop, and get immediate access to them in your Photoshop font menu. 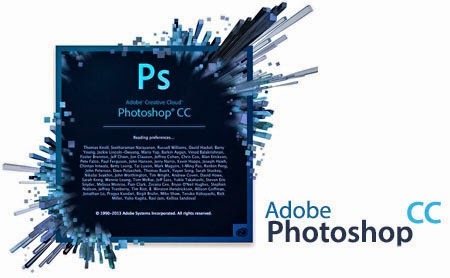 Photoshop will even automatically replace missing fonts in your documents. Font Search - Search for fonts by name, and see instant previews of each font to zero in on the perfect one. Expanded 3D printing capabilities - Now you can see exactly where and how Photoshop repaired your 3D meshes so it's easy to refine your designs in third-party 3D modeling apps. Get more accurate renderings of your models prior to printing thanks to WYSIWYG previews. And get support for more 3D printers and service providers. Adobe Generator enhancements - Simplify the process of naming Generator assets and get greater flexibility in organizing the output from Generator by setting document-wide defaults, and by specifying subfolders for exported assets. Generator also offers new APIs so developers can create even more powerful plug-ins. Adobe Camera Raw 8 enhancements - Heal images, fix perspective distortions, and create vignettes with greater precision. Plus, access an interactive histogram, before/after previews, and more. Improved Windows 8.1 stylus support - Get to work quickly and comfortably with your stylus on Windows 8.1 devices, and enjoy smoother brush strokes thanks to higher-frequency sampling. Expanded Mercury Graphics Engine support - Upsample images up to 15 times faster (depending on file size and video card configuration) now that the Mercury Graphics Engine delivers an OpenCL performance boost. The engine powers new Blur Gallery motion effects and the Focus Mask feature, too. Experimental features - A new preference setting allows you to test drive and help shape new Photoshop features before theyâ™re officially released. Intelligent upsampling, even faster - Enlarge a low-res image so it looks great in print, or start with a larger image and blow it up to poster or billboard size. Upsampling preserves detail and sharpness without introducing noise, and now you get even more immediate results thanks to an OpenCL boost from the Mercury Graphics Engine. Workflow Enhancements - Work faster and smarter thanks to new feature enhancements throughout your workflows. Now you have access to an expanded Color Panel; you can access your most recently used brushes, sync your workspaces, keyboard shortcuts, and menu customizations with Sync Settings; and more. And so much more - Also includes: support for very large PNG files; the ability to export 3D LUTs; support for new video formats including Sony RAW and Canon RAW; and more.